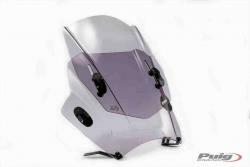 UP&DOWN model windshield-high for round headlight of the PUIG Street Screen line, they stand out for their quality, easy assembly and their design. These windshields, besides improving aerodynamics, offer a wind and cold protection appreciated by many riders when deciding on purchasing a windshield. 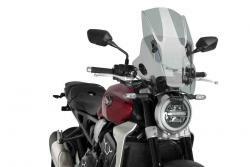 Mounted in a few minutes your windshield can be mounted on your motorcycle. Four fixing points: 2 to handlebar and 2 to forks. 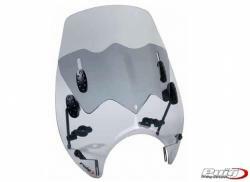 If you have a round headlight motorcycle, you will enjoy the adjustable screen!